There is a story about a farmer who owns a buffalo. Not knowing that the buffalo is in its stable, the farmer goes off to search for it, thinking it has strayed from home. Starting off on his search, he sees many different buffalo footprints outside his yard. The footprints of buffalo are everywhere! The farmer then thinks, "Which way did my buffalo go?" He decides to follow one set of tracks and they lead him up into the high mountains, but he doesn't find his buffalo there. Then he follows another set of footprints that lead him way down to the ocean. However, when he reaches the ocean, he still doesn't find his buffalo. His buffalo is not in the mountains or at the beach. Why? Because it's back home in the stable in his yard. Like the farmer, we search for happiness and peace of mind outside ourselves. We search for freedom from our troubles high up in the mountains, at pristine, beautiful beaches, and in the serenity of retreat settings. In all of these places, there are footprints everywhere, signs of like-minded seekers searching for happiness and a more enlightened existence. In the end, you might find traces of the contentment and illumination they realized. What you will not find, however, is the one thing you are looking for -- your own happiness, peace of mind, and enlightened nature. You may find someone else's version of it, but it is not the same as finding your own. No matter how much you may admire and long for the happiness and freedom of mind you perceive in someone else, whether it's a great spiritual master, a best-selling self-help guru, or a true, modern-day hero or heroine, finding your own wakefulness, your own enlightenment within, is much different. It is like finding your own buffalo. Your buffalo recognizes you and you recognize your buffalo. The moment you meet your own buffalo is a very emotional and joyful moment. In order to make our own discoveries, we have to start right here where we are. We have to search inwardly rather than outwardly. From the Buddhist point of view, ultimate happiness -- the state of freedom, or enlightenment -- is within our minds and has been from beginningless time. Like our buffalo comfortably resting in its stable, ultimate happiness has never left us, although we have developed the idea that it has left home. We think it is somewhere outside and we have to find it. With so many footprints leading in different directions, so many possibilities for where it could be, we may start to imagine things. We could think that it was stolen by a neighbor and is gone forever. We start to have all kinds of misconceptions and mistaken beliefs. From the Buddhist point of view, there is nothing within our ordinary life that we need to reject or leave behind, and the state of enlightenment is not a place we go to from here. It is not a place that is found outside of where we are right now. If you wanted to find a perfect get-away from all your stress and unhappiness, where and how far would you go? To the other side of the world, to the International Space Station, or just the nearest bar? Your body would be somewhere else, but still, you would be taking your stressed, unhappy mind with you. What we are actually trying to leave behind is the mind's confusion, which keeps us from being happy. It is how our minds function when we are in those mountains, at the beach, at work or at home, that determines whether we are happy or unhappy, awake in our life or sleeping through it. According to the Buddha, the actual point of all our efforts on the spiritual path is simply to return to the state of complete wakefulness, which is the true nature of our minds. Our minds are brilliantly clear and aware naturally, but that brilliant wakefulness is hidden from our view by clouds of confusion. These clouds are caused primarily by the turbulence of our thoughts and emotions. There is so much commotion going on in our minds that our view of who we are and what the world is like is distorted. If that's the case, then how can we recognize the wakeful nature of our minds? The Buddha taught many methods of meditation, which bring stability, peace, and clarity to our agitated minds. Through the practice of meditation, we begin to relax; we feel like we're waking up and coming to our senses. It's a very ordinary, but profound, experience that deepens over time and transforms our view of life. When we start to work with our mind in meditation, there's a sense of effort, but as we go along, it becomes effortless. A good example of this is a bird taking off from the ground. When the bird wants to fly, it first has to run a little bit and then push down against the ground, so it can leap up into the space of the sky. So long as we are looking outside of ourselves, there is no place to go, no end of the road, where we will one day find perfect happiness. Ultimately, the awake and peaceful mind that we are looking for is with us right now, in this very moment. We don't have to pack our bags or follow someone else's trail to discover the true nature of our mind -- the buddha within us. That buddha is always within our reach. Do you see it? Where are you looking for your buffalo? 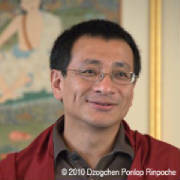 Dzogchen Ponlop Rinpoche is a widely-celebrated teacher known for his skill in making the full richness of Buddhist wisdom accessible to modern minds. Author of "Mind Beyond Death," his forthcoming book is "Rebel Buddha," available in November 2010.